HOUSTON – Southern University used free throws in the final seconds to defeat Texas Southern on Thursday at H&PE Arena. With the win, SU (13-15, 12-5) captured the season series against TSU (18-10, 15-2) and ended the Lady Tiger’s win streak at 15 games. With 19 seconds remaining, Britney Washington gave SU a 54-53 edge after hitting a pair of free throws. TSU committed a turnover on the next play before Yasmin Fuller’s free throw with nine seconds on the clock produced the final score. The Lady Jaguars shot 34 percent overall and connected 37 percent from arc. TSU shot 42 percent overall and were led by Te’era Williams’ 17 points. Janelle McQueen added 10 points. 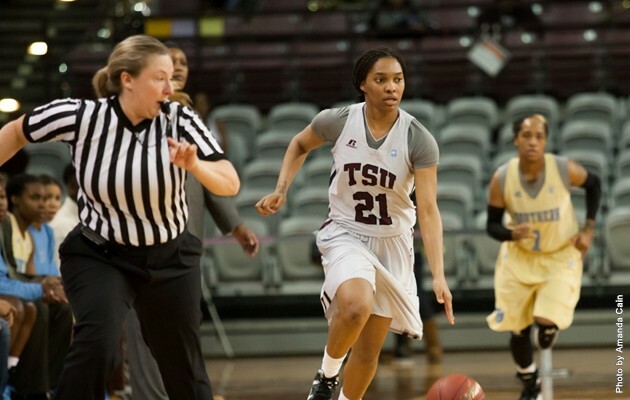 Kayla West helped TSU dominate the boards, 41-28, with a game high 11 rebounds. West gathered 10 rebounds on the defensive end and dished out a game best, six assists. Texas Southern shot 42 percent from the field going 18-of-42 while Southern shot 34 percent on a 19-of-55 shooting night from the floor. TSU outscored the Jaguars 32-to-24 inside the paint and converted a total of 16 points in transition. The Lady Tigers will host their home finale on Saturday, March 2 against the Alcorn State Lady Braves at the H&PE Arena at 5:30 pm. The game will also be Senior Day for four members of the basketball team. Texas Southern has clinched the number one seed at the 2013 SWAC Women’s Basketball Tournament in Dallas. Head coach Cynthia Cooper Dyke is 2 victories shy of reaching 150 wins as a head coach. The Lady Tigers school record winning streak ends at 15 straight games dating back to Jan. 4. TSU’s 15 game winning streak was the eighth longest active streak in the NCAA Division I going into the game with SU. Te’era Williams scored a team season high 25 points against Alabama A&M. *Texas Southern has set new school records for consecutive wins (15) and overall wins during the regular season (18).